Magic on Ice, the phantasmagorical art, magic and conjuring show created by Steve Wheeler, sold out for ten days at the Blue Square Theatre in Seoul, South Korea, with 20 shows and over 20,000 spectators. The famous American magician, who lives and works in Las Vegas, started doing his travelling show several years ago to make a name for himself worldwide. 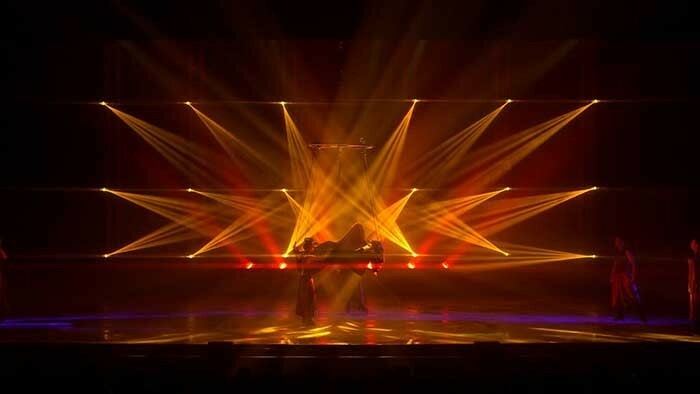 Emiliano Morgia, the show's lighting designer in South Korea said: "We met in Dubai, where I worked on one of his shows, and he called me again for this one in the Far East." The lighting rig included 24 Alpha Profile 1500s, 24 Alpha Spot HPE 700s and Clay Paky Sharpys. "One interesting aspect of the pre-production was that I prepared everything at home with WYSIWYG. In particular, I connected up remotely with Steve Wheeler, who was also the creative director," Emiliano Morgia said. "We worked together 8,000 kilometres apart and built the whole show virtually. After seeing the effect, Steve Wheeler himself asked to use Sharpys to create a lighting architecture that only these lights can provide." Magic on Ice has a very unique feature: it is one of the few shows on ice that not only takes place in rinks, but also in theatres. It is a magical blend of entertainment, magic, lights and colours, with - in addition - all the complications that stem from ice. The skating surface was lit in a very particular way: "We provided side lighting that illuminated the skaters without reaching the ice," said Emiliano. "I was happy to use Sharpys. We put three on each tower. They allowed us to create lighting architectures without even the slightest halo. I used the colour changer, gobo changer and prism very often to create a true composition of graphic effects. Given the Sharpys' extraordinary penetration, I had to use them at 30% of their power, and yet they still marked the stage in an unmistakable way." Steve Wheeler was highly satisfied with the outcome and said he was "very happy to have worked with Emiliano Morgia owing to his special passion for lights and devotion to lighting design details." The whole show was timecoded and the Sharpys were used with very fast effects on changes in the music. The speed of all the Sharpy's components meant these lights helped like no other lights could have done: colour changes, gobo changes and a frenetic succession of pans and tilts marked out the scene changes with very accurate cuts. The Sharpys were faded for the much slower scenes, but the accuracy of their movements was still high quality. "I designed the lighting imagining that the show would be videoed," Emiliano Morgia concluded. "One more reason to use highly professional lighting equipment only, like Clay Paky has been providing for more than 35 years."